Bitcoin adopters like Bitcoin gambling enthusiasts are in agreement with the need to have user-friendly transactions. Simple processes of buying and selling bitcoins as well as sending and receiving them are well appreciated by the community. However, there is a growing demand for a faster and safer method. These are reasons enough for the startup Cubits to find its niche and to excel in its craft. With offices in London and Berlin, this website takes on different roles. It functions as a Bitcoin wallet, a Bitcoin exchange, and a Bitcoin payments platform. Through these services, those bitcoiners eager to experience convenience and speed for every Bitcoin transaction are poised to witness top performance and innovation. Through the Cubits Wallet, users may store the bitcoins they receive and use it to make further transactions. Besides those, this wallet can also be used to buy and sell the digital currency without much hassle usually experienced in a typical Bitcoin exchange online. This service is open to anyone across the globe, but it is worth mentioning that this UK firm is focusing on the European markets first before venturing into the international scene. With its intention to cater globally, this Bitcoin wallet can store up to 17 different global currencies. This feature alone already broadens the market of this website and presents the innovations it is dedicated to contribute to the maturing Bitcoin ecosystem. Unlike the exchanges, however, Bitcoin purchases are processed within only a few minutes as compared to the former’s which may take several days. The instant payments may be done using the services rendered by SOFORT Banking, OnlineBankTransfers (OBT), and OKPay. When it comes to the security of the funds, there is nothing to worry about because Cubits ensures all its clients that their funds are stored offline in a cold storage. Likewise, the wallet employs the multi-signature technology that guarantees smooth, authorized, and problem free transactions through the wallet. Aside from the promising Bitcoin wallet, this platform also offers a product that is more focused on the business side of the Bitcoin community. Merchants are the primary market for its payments system, which enables them to receive payments via credit cards and online payment options with lower transaction fees. The merchants will also be able to benefit from the free currency conversion from cryptos to fiat, as well as the custom-made plug-ins that are designed by the startup to work seamlessly with different shopping cart systems on the web. 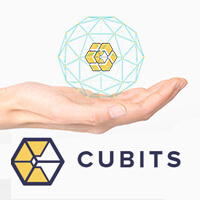 With its wallet, exchange, and payments platform, Cubits deserves the thumbs up for ensuring instant transactions that are safe and friendly toward different markets wherever they may be in the world. Its quick and hassle-free services will greatly benefit the community, even more so the Bitcoin gambling enthusiasts who value speed and accessibility to play in the Bitcoin casino sites online.